This residential lease agreement was created by Vertex42.com and Utah real estate attorney Dean Smith. We tried to keep the template as simple as possible, and we provided some guidance below on how to use the template. However, you should still have the agreement reviewed by an attorney before giving it to any renter to sign. Insert the full street address of the house including city, state and zip code. 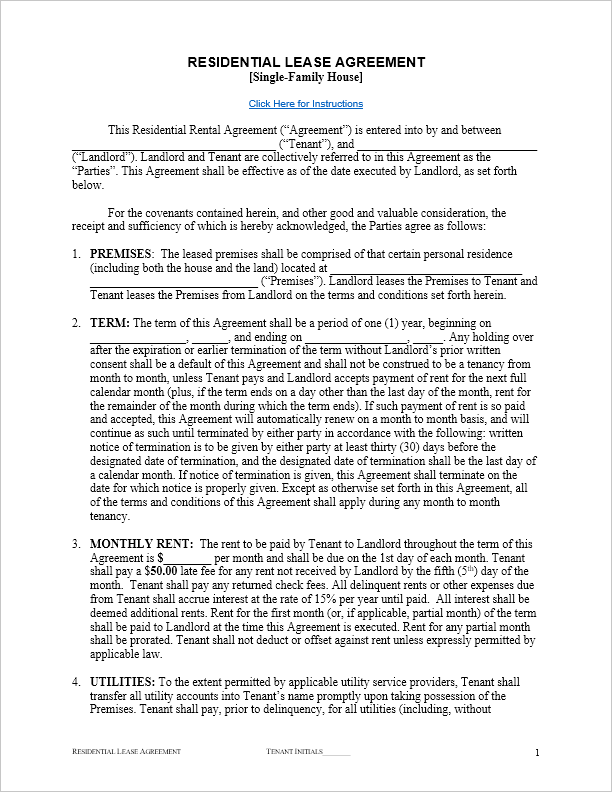 This lease agreement template provides for a one year term, which is the most common, however the term can be longer or shorter as agreed upon by the parties. In the first blank, insert the date on which the rental term will begin. This is the date on which the tenant can take possession and begin to occupy the premises, and the date on which rent will commence. Ideally, the term will begin on the first day of a calendar month (this approach makes the accounting and record keeping easier), but it doesn't need to. In the second blank, insert the date on which the rental term will expire. For a one year term, this will be the day before the anniversary of the start date, for example: beginning on February 1, 2017, and ending on January 31, 2018. Insert the amount of the monthly rent to be paid by tenant to landlord. The rent does not include the cost of utilities, which are separately paid for by tenant, as set forth in Section 4. In addition to the rules set forth in this section, the landlord may wish to provide a more detailed list of house rules and regulations to the tenant. If so, the landlord should provide a copy of the rules and regulations to the tenant prior to the parties signing the rental agreement. If the house is subject to any Covenants, Conditions and Restrictions (CC&Rs), HOA agreements, or other similar instruments, copies of such documents should be given to tenant prior to the parties signing the rental agreement. If the house was built before 1978, the Lead-Based Paint Disclosure and Pamphlet (available at www.epa.gov) should be given to tenant prior to the parties signing the rental agreement. If the house was built in 1978 or later, the second paragraph of Section 6 can be deleted from the rental agreement. In the first blank, insert the amount of the security deposit. Often this amount is equal to one month's rent, however the parties may choose to agree on any amount. In the second blank, insert the portion (if any) of the security deposit that will not be refundable at the end of the term. For example, the landlord might have a policy of having the carpets professionally cleaned after each tenant, and in that case the landlord might state that $200 of the security deposit will be non-refundable. Of course, the landlord has the right to utilize the entire deposit, if necessary, toward unpaid rent or the cost of repairing any damage to the premises caused by tenant, as set forth in more detail in this section of the agreement. Insert the names of landlord and tenant (if there are two or more tenants, insert the names of each of them) and have each person sign and date the agreement. Utah Real Estate Attorney Dean Smith at www.utahrealestateattorney.org - Vertex42 acknowledges the assistance of Utah real estate attorney Dean Smith in connection with the lease agreement template and content on this page. Dean can be contacted for assistance with legal matters involving real estate.